Police officers guard the entrance to Franklin Street in Watertown, Mass., where Boston Police say they have captured the second suspect in the marathon bombings. 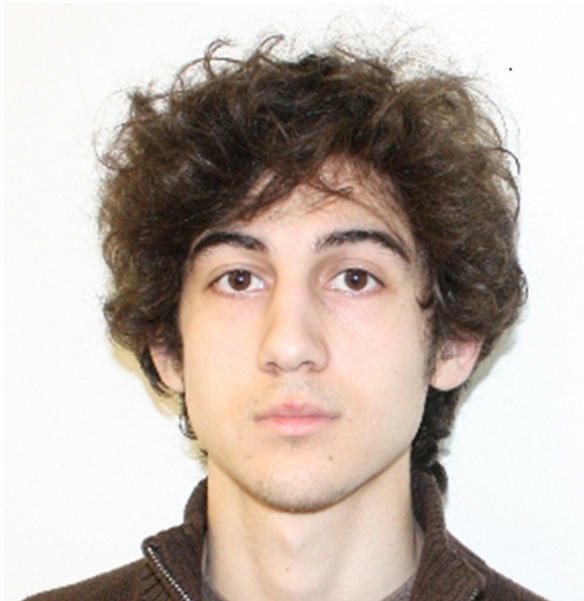 Dzhokhar Tsarnaev, the subject of the manhunt in Boston, in a photo released by the FBI. He's a suspect in the Boston Marathon bombings. 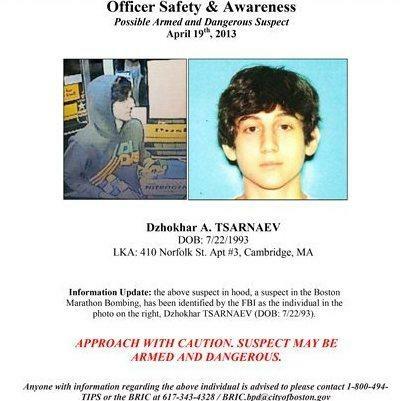 The Boston Regional Intelligence Center early Friday released this wanted poster showing Dzhokhar A. Tsarnaev, one of the suspects in the Boston Marathon bombings. He survived and firefight with police and was on the run. After a massive manhunt that locked down most of the Boston metropolitan area, police apprehended Dzhokhar Tsarnaev, whom the FBI had identified as suspect 2 in the deadly bombings at the Boston Marathon. The Boston Police Department made the announcement in a twitter message late Friday night. Dzhokhar was found hiding in a boat in the back of a house in Watertown, Massachusetts. A homeowner, who walked to his backyard, shortly after police called off the lockdown, saw blood on his boat. He picked up the canvas cover and saw the suspect lying there. Police surrounded the house at around 7:30 p.m. ET. Using thermal sensors, helicopters picked up his movement and after more than an hour of the hostage rescue team trying to communicate with him unsuccesfully, they moved in and he was apprehended. Residents of Watertown took the street en-masse. Television images showed them cheering on emergency workers and chanting "USA! USA! USA!" WBUR's Fred Thys reports the "19-year-old suspect was bloodied when taken into custody." NPR's Richard Knox reports that he was taken to Beth Israel Deaconess Hospital. Tamerlan Tsarnaev, Dzhokhar's older brother, whom the FBI identified as suspect 1 in the bombings, was killed in a gun exchange early Friday with police in Watertown, Mass. Mass transit service in the Boston area was suspended Friday morning. So was taxi service for the first few hours of the day. Drivers were being told to stay off the streets in Watertown. Businesses there were told not to open. Boston city officials asked residents to "please go home" and not congregate at bus stops or other places. Just after 8 a.m. ET, officials said the "shelter in place" advisory had been extended to the entire city of Boston. The dramatic series of events began to unfold late Thursday, with what turned out to be an unrelated robbery at a convenience store in Cambridge, Mass., and the shooting death of a police officer on the campus of the Massachusetts Institute of Technology. Minutes later, officials say, an SUV was carjacked in Cambridge. That SUV was driven to Watertown. There, authorities say, the suspects threw explosives at police and exchanged gunfire. One of the two — known as "black hat" for the cap he was seen wearing at the marathon — was critically injured and later died. The other, "white hat," whom the FBI says was seen in security video dropping off a backpack near the second explosion, fled the area and led authorities in a massive manhunt that culminated late at night. "CAPTURED!!! The hunt is over. The search is done. The terror is over. And justice has won. Suspect in custody," Boston Police Department tweeted. They added: "In our time of rejoicing, let us not forget the families of Martin Richard, Lingzi Lu, Krystle Campbell and Officer Sean Collier." We're following the story and updating as news comes in. There's a timeline of the manhunt posted here; a story about the Boston lockdown is here; a profile of the suspects is here, and NPR's coverage of the bombings and the search for the suspects is collected here. "None of this will bring our beloved Martin back, or reverse the injuries these men inflicted on our family and nearly two hundred others. We continue to pray for healing and for comfort on the long road that lies ahead for every victim and their loved ones. "Tonight, our family applauds the entire law enforcement community for a job well done, and trust that our justice system will now do its job." A Department of Justice official tells NPR's Carrie Johnson that Dzhokhar Tsarnaev will not be read his Miranda rights for now. "We plan to invoke the public safety exception to Miranda in order to question the suspect extensively about other potential explosive devices or accomplices and to gain critical intelligence," the official said. "We owe a tremendous debt of gratitude to all our outstanding law enforcement officials," President Obama said this evening. Obama then went on to remember the MIT officer killed during the course of the manhunt and went on to mention the three people who were killed during the bombings. "Tonight there are still many unanswered questions," Obama said. Among them, he said, why would a young person, who grew up in the United States "resort to such violence." Also: "How did they plan" this and "did they have any help." "The families of the victims deserve answers," Obama said. "The wounded deserve answers." Obama also took on the greater issues. He said whatever the bombers were trying to accomplish "they've already failed." "They failed because we will not waiver from the character and the compassion and the values that define us as a country," Obama said. The president reminded the country that as the investigation and judicial process continue, Americans need to "stay true" to the unity and diversity that "makes us strong as a country." Boston Police Commissioner Edward F. Davis says police were called to a residence in Watertown after a home owner came outside and saw blood on his boat. He picked up the tarp and saw a man covered in blood. Police rushed to the scene, setting up a perimeter. Police and the suspect exchanged gun fire and the "hostage rescue team made entry into the boat." The suspect, said Davis, was alive. The hostage rescue team tried to communicate with him before moving in, but he did not respond. "The man who found him at the boat said he was covered in blood," Davis said. "We assume the injuries occurred the night before." Col. Timothy P. Alben, superintendent of the Massachusetts State Police, said the suspect was in "serious condition." "We're exhausted but we have a victory here tonight," Col. Timothy P. Alben, superintendent of the Massachusetts State Police said during a televised news briefing. Mass. Gov. Deval Patrick echoed those sentiments, saying that tonight is one "where we're all going to rest easier." President Obama is also scheduled to speak after this press conference is over. "Source says it's unclear whether the suspect was wearing a suicide vest or had some other type of booby trap. "We expect more details about the operation later tonight." Boston Police tweeted that authorities would hold a 9:30 p.m. ET. press conference. After a day in which authorities asked most of Boston to stay indoors, crowds of people have rushed into the street, after word came that the fugitive suspect in the Boston Marathon bombing had been captured. Television images show people milling around on the streets, cheering every time a law enforcement vehicle drove by. "Suspect in custody. Officers sweeping the area. Stand by for further info. Talking to All Things Considered, Keith Glavish, who lives about five houses away from where police believe Dzhokhar is located, says he can hear a helicopter overhead and has occasionally heard "shots" that "sound like firecrackers." "The whole scene is totally surreal," Glavish said. "I mean, this is a very, very quiet neighborhood. ... I pinch myself to realize that this is actually unfolding, literally outside our door. We've been inside all day long, cooped up, and thinking, 'Well, it's on the other side of Watertown, we don't really have to worry.' I took the dog in the backyard a few times. But this is unbelievable." "We know you're in there," the Globe reports police are saying. "Come out on your own terms. Come out with your hands up." As we wait for more information about what's happening at a boat in Watertown, we have more news on the investigation: NPR's Dina Temple-Raston reports that an FBI source tells her that "the agency interviewed the older brother Tamerlan in 2011 at the request of a foreign government." At the end of the investigation, they didn't "find anything that was enough to allow them to hold onto him." "Her biggest suspicion surrounding the case was the constant FBI surveillance she said her family was subjected to over the years. She is surprised that having been so stringent with the entire family, the FBI had no idea the sons were supposedly planning a terrorist act." An FBI source tells NPR's Dina Temple-Raston that police have located the suspect. "Officers are proceeding with caution as an official fears the suspect may have booby-trapped the scene. "FBI is waiting for a tactical team and bomb technician. "FBI is behaving as if the suspect is still alive." "Marathon bombings suspect believed to be inside boat in back yard of Watertown home. The boat was surrounded by police." "President Obama thanked President Putin for those sentiments, and praised the close cooperation that the United States has received from Russia on counter-terrorism, including in the wake of the Boston attack," the White House said in a statement. "The two leaders agreed to continue our cooperation on counter-terrorism and security issues going forward." "Police operations in the Franklin Street Watertown area. Residents shelter in place." Col. Timothy Alben asked Dzhokhar to "stop any further violence toward anyone," and turn himself in. During a news briefing in Watertown, Massachusetts, a short time ago, authorities said the "stay-indoors request" has been lifted, but that no suspect has been arrested. Gov. Deval Patrick said that while people should feel free to go about their business, they should "remain vigilant" because "there is still a very dangerous person out there." Col. Timothy Alben said police went up and down 20 streets, "door to door" conducting "limited searches." Police followed many leads, but none of them have been fruitful. "We do not have apprehension ... but we will have one," said Alben. "Some time later: MBTA police spots car and pursuit ends in Watertown"
A Massachusetts State Police spokesman Dave Procopio says police have recovered "numerous pieces of evidence" in Watertown, including "homemade explosives... pipe bombs and another pressure cooker, as well as more than 200 spent rounds." "The bombers did purchase gas at a gas station in Cambridge later in the chain of events and we recovered images of them there," State Police spokesperson Dave Procopio told WBUR. We're also awaiting a news conference, scheduled for 5:30 p.m. ET. Tamerlan was "athletic, outgoing, nice guy, very respectful, just the opposite of what you paint as a terrorist," Curan told NBC News. Dzhokhar was "the most popular kid in high school"
The Sox tweeted they were postponing their game to "support efforts of law enforcement officers." "No longer seeking 1999 Honda Civic. Tips to: https://bostonmarathontips.fbi.gov . #FBI #BostonMarathon"
Update at 2:59 p.m. ET. Dzhokhar's Twitter Account? A classmate of Dzhokhar tells NPR's Andy Carvin that the twitter account @J_Tsar was indeed his. Another classmate tells Buzzfeed the same thing. Dzhokhar also appeared to have an Amazon Wish List. Among the items on it, books on how to forge driver's licenses and books about Chechen history. Radio Liberty, an overseas news service funded by the United States, spoke to Anzor Tsarnaeov, whom they and the AP identified as the suspects' father. According to an English translation by Sergei Sotnikov, a producer at NPR's Moscow bureau, the father said he could not imagine his sons doing such a thing. "Knowing our children — you see we know our children — if a person didn't pray how he can go and blow up or something... I don't know. I have never seen either explosives... nothing," Tsarnaeov said. Later in the interview he said this was a "setup." This is very much in line with what the suspects' aunt, Maret Tsarnaev, told NPR's Joe Shapiro. "This totally doesn't make sense to me," she said, adding that authorities had not released definitive proof that these were the people responsible for the Boston blasts. "Tamerlan and Dzhokhar never were extremists," Tsarnaeve said. "Never had enemies. Never had any — of course everybody has opinion on every issue. But does mean that you live with it, and you would go for a heinous ugly act? Like happened on that marathon street in Boston. And again, all I can see these two boys are walking on the street." "Bombing suspect may be driving 4-door, '99, green Honda Civic w/ Mass. plates reading: 116GC7. #FBI#BostonMarathonhttp://1.usa.gov/11oEKTB "
The family of the slain MIT officer tells The Boston Globe that they are "heartbroken" at the loss of Sean Collier. "Our only solace is that Sean died bravely doing what he committed his life to – serving and protecting others," the family statement read, according to the Globe. "We are thankful for the outpouring of support and condolences offered by so many people. We are grieving his loss and ask that the media respect our privacy at this time." A photo gallery about Tamerlan Tsarnaev says he thought he could some day be selected to box for the U.S. in the Olympics. But, "he was not close to making an Olympic team or national team," USA Boxing spokeswoman Julie Goldsticker says in a statement forwarded to us by NPR's Howard Berkes. She adds that "as a non-citizen, he would have been precluded from competing in any qualifying tournaments or USA Boxing national events. In addition, he lost his first bout in the only national tournament he competed in, which was the 2009 Golden Gloves." Police have now searched "well over 60 or 70 percent of want we want to cover" in Watertown, Col. Timothy P. Alben, superintendent of the Massachusetts State Police, just said to reporters. He also said there will be a "controlled explosion" later this afternoon on Norfolk Street in Cambridge — presumably at or near a home where at least one of the suspects lived. "The stay indoors request continues," Gov. Deval Patrick (D) just told reporters. -- While the family is Chechnyan, it lived in Chechnya for just one year, in 1994. Like many Chechnyans, members of the family were forced to flee during World War II and spent decades in Kyrgyzstan. -- Tamerlan Tsarnaev, the older suspect who was died early Friday, became a more devout Muslim in recent years. But she does not believe he carried a hatred toward other religions and says he fathered a child by a Christian woman. -- Dzhokhar Tsarnaev graduated from Cambridge Rindge and Latin School, where in 2011 his wrestling prowess earned him a citation as one of the "Greater Boston League Winter All Stars." 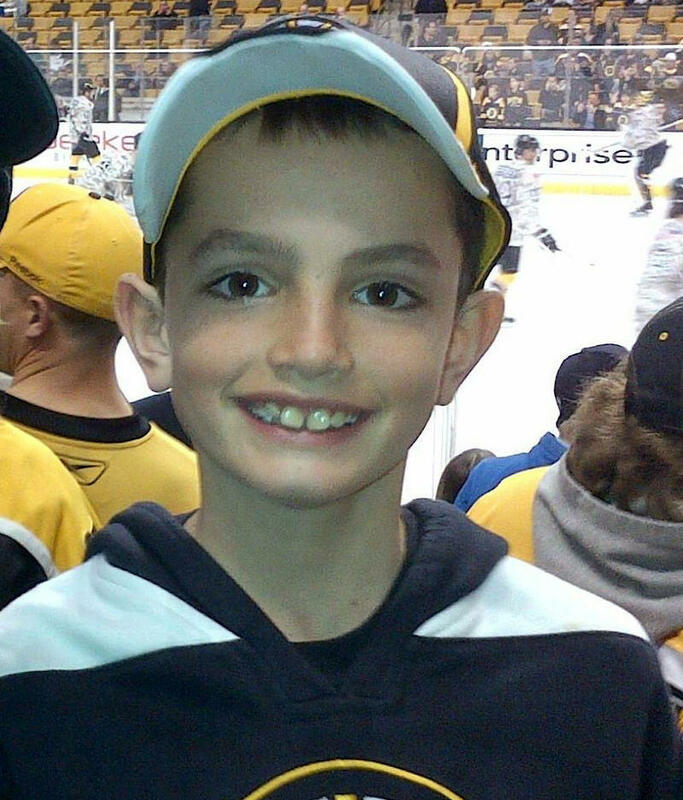 A former teacher at the school described him to The Boston Globe as having a "heart of gold." On Vkontakte — described as the Russian equivalent of Facebook — he lists his personal priority as "Career and money," and his world view as "Islam." -- Tamerlan Tsarnaev was a boxer and participated in a 2009 New England Golden Gloves tournament, where he was described as being from Lowell, Mass. The Lowell Sun newspaper reported that he won his first fight in 2004, and was quoted as saying: "I like the USA. America has a lot of jobs. That's something Russia doesn't have." Update at 11:45 a.m. ET. "He Put A Shame!" On Family And Chechens, Uncle Says. Calling them "losers" and saying that the suspects had "put a shame!" on their family and all Chechens, a man identified as an uncle of the Tsarnaev brothers just gave reporters in Boston an emotional statement. And Ruslan Tsarni appealed to suspect Dzhokhar Tsarnaev to turn himself in. "UMass Dartmouth is closed and is in the process of a controlled evacuation of the campus. Students, staff and faculty have been asked to leave campus in a calm and orderly fashion. This action is in response to information that the person being sought in connection with the Boston Marathon bombing is a registered student. State, local, and campus police are on campus to assist with the evacuation and to conduct a full investigation." The school is located 60 miles south of Boston, near New Bedford, Mass. Reached by telephone in the Russian city of Makhachkala, Anzor Tsarnaev has told The Associated Press that his younger son, Dzhokhar, is "a true angel." "He is such an intelligent boy. We expected him to come on holidays here," the father also said. Boston police follow up with this message: "UPDATE: Vehicle (MA Plate: 316-ES9) found unoccupied. Car being processed for evidence by authorities." "#WANTED: Police seeking MA Plate: 316-ES9, '99 Honda CRV, Color - Gray. Possible suspect car. Do not approach. pic.twitter.com/11eRTJdtaZ." Update at 10:20 a.m. ET. How Did "A Beautiful, Beautiful Boy" Get Involved? "It's stunning," WBUR host Robin Young says of hearing that 19-year-old Dzhokhar Tsarnaev is the fugitive who's suspected of being one of the young men who planted the bombs at the Boston Marathon and now of being involved in deadly gun battles with police. "I had the prom party for that class in my back yard," she says of Cambridge Rindge & Latin High School students, who included Tsarnaev and Young's nephew Zolan. The fugitive, she says, was "the light of the party ... a beautiful, beautiful boy." But when she saw the photo released early Friday of a suspect robbing a convenience story, she could tell it was him. Young's family has known Dzhokhar Tsarnaev since he was a young high school student and she saw "no sign of this ... no sign." If anyone says that 19-year-old Dzhokhar Tsarnaev's "character, attitude ... or activities that he did daily" would have indicated he was likely to bomb the marathon or engage in shootouts with police, "they're absolutely lying," says a friend of the fugitive. Zolan Young, nephew of WBUR's Robin Young, spoke with Morning Edition moments ago. He's known Dzhokhar Tsarnaev since they were both in high school. "I can't emphasize how much a courteous guy he was," Zolan Young said. "This was someone that I could always count on." The last time Young heard from Tsarnaev was during this year's Super Bowl, when Tsarnaev texted him to ask if Young was having a party. "I'm shocked," said Zolan Young. "This is one of my friends." As people search for information about the suspects, they're coming on some interesting material on social media sites. Bear in mind: It will be hours, if not days, before material on such sites can be verified. One that's getting particular attention: This photo gallery of a young man identified as Tamerlan Tsarnaev, the suspect who died after a gun fight with police. This caption is under one photo: "Originally from Chechnya, but living in the United States since five years, Tamerlan says: 'I don't have a single American friend, I don't understand them.' " There's a page reported to be about Djohar Tsarnaev here (we're seeing his named spelled as "Dzhokhar" in other places). WBZ-TV has spoken with Ruslan Tsarni, identified as the suspects' uncle, who says of his nephew Tamerlan's death, "he deserved his." Tsarni added that "they do not deserve to live on this earth." A law enforcement source of NPR's Carrie Johnson tells her that his agency increasingly believes that Dzhokhar Tsarnaev, the suspect who police are searching for, is acting in a way that indicates he does not want to be taken alive. There's a heavy concentration of police activity now in one part of Watertown (all the news networks are broadcasting live from the scene). Reporters at the scene say they've heard police use loudspeakers to tell someone to come out of a building. News crews have been told by police to move back from the area. A local Fox News cameraman reports hearing police use a loudspeaker to say, "Give yourself up, come out, come out." When he heard gunshots and explosions overnight, Dr. David Schoenfeld of Beth Israel Hospital tells Morning Edition, he went to the hospital. Soon after, an injured man — the bombing suspect now identified as 26-year-old Tamerlan Tsarnaev, was brought in. He had "multiple traumatic injuries," Schoenfeld says, from "bullet wounds or shrapnel." Doctors worked to keep him alive, but it was quickly apparent that their efforts would not be successful. The suspect who authorities are searching for apparently made his escape by driving the stolen SUV straight at police and forcing his way through, NPR's Tom Gjelten reported on Morning Edition. The "shelter-in-place" advisory has been extended to the entire city of Boston as well as such suburbs as Watertown and nearby communities, Boston Police Chief Ed Davis just told reporters. There are about 4.5 million people in the Boston metropolitan area. With mass transit in and around Boston shut down while the search for the suspect continues, NPR's Jeff Brady reports from Watertown that buses are being used to bring more police officers to help in the manhunt. NPR's Dina Temple-Raston tells Morning Edition that National Security Council officials say the dead suspect was Tamerlan Tsarnaev, who as we reported earlier is said to be the older brother of the young man who is still on the run. Authorities say the brothers are from Chechnya. A third man, who authorities believe was an accomplice of the bombing suspects, has been arrested according to NPR's Dina Temple-Raston. He may be the man, seen in videos earlier Friday, who police ordered to strip naked and was then put in the back of a patrol car. "Roughly 381,000 people are sheltering in place as ordered by police in Massachusetts." The Associated Press and NBC News minutes ago reported being told by sources that authorities think they have determined the identities of the two bombing suspects, and that they are brothers. NPR's Dina Temple-Raston checked with her law enforcement sources as well and is being told that the suspects are from Chechnya and that the suspect who is on the loose is 19-year-old Dzhokhar A. Tsarnaev. "With MBTA suspended, please do not congregate at stations and bus stops. Please go home," the city of Boston says on its official Twitter page. – There's an active search for the suspect who fled, the FBI's bombing "white hat suspect"
Update at 5:05 a.m. ET. Boston Police Commissioner's Statement On Death Of Suspect. The Boston Police Department has put this message on its Twitter page: "Per Commissioner Davis: One suspect deceased, 2nd suspect (white hat) at large & considered armed & dangerous." The bombing suspect known as "black hat" for the color of the cap he was seen wearing at the marathon was killed in the exchange of gunfire with police in Watertown, sources with knowledge of the events tell NPR's Dina Temple-Raston. Update at 4:35 a.m. ET. Prosecutor's Account Of The Events. "Police are investigating a fatal shooting of MIT campus police officer by two men who then committed an armed carjacking in Cambridge, Middlesex Acting District Attorney Michael Pelgro, Cambridge Police Commissioner Robert Haas, and MIT Police Chief John DiFava announced this evening. "At approximately 10:20 p.m. April 18, police received reports of shots fired on the MIT campus. At 10:30 p.m., an MIT campus police officer was found shot in his vehicle in the area of Vassar and Main streets. According to authorities, the officer was found evidencing multiple gunshot wounds. "He was transported to Massachusetts General Hospital and pronounced deceased. "Authorities launched an immediate investigation into the circumstances of the shooting. The investigation determined that two males were involved in this shooting. "A short time later, police received reports of an armed carjacking by two males in the area of Third Street in Cambridge. The victim was carjacked at gunpoint by two males and was kept in the car with the suspects for approximately a half hour. The victim was released at a gas station on Memorial Drive in Cambridge. He was not injured. "Police immediately began a search for the vehicle and were in pursuit of the vehicle into Watertown. "At that time, explosive devices were reportedly thrown from car by the suspects. The suspects and police also exchanged gunfire in the area of Dexter and Laurel streets. During this pursuit, an MBTA Police officer was seriously injured and transported to the hospital. "During the pursuit, one suspect was critically injured and transported to the hospital where he was pronounced deceased. An extensive manhunt is ongoing in the Watertown area for the second suspect, who is believed to be armed and dangerous." The district attorney in Middlesex County, Mass., has released a statement saying that "one suspect was critically injured and transported to the hospital where he was pronounced deceased." The other suspect is said to be at large and authorities have released a photo of him. The state police say he resembles "suspect No. 2" in the bombings. A source with knowledge of the situation tells NPR's Dina Temple-Raston that the situation is fluid and that it's too soon to say for certain whether or not the individuals involved in the events that began at MIT and have extended into Watertown are related to the marathon bombings. -- "Residents in and around Watertown should stay in their residences. Do NOT answer door unless it is an identified police officer." -- "If any concerns about someone at door, call 911 immediately. Repeat--Do not answer door, stay away from windows, keep doors locked." -- "Police will be going door by door, street by street, in and around Watertown. Police will be clearly identified. It is a fluid situation." "The officer had been responding to report of a disturbance Thursday night when he was shot multiple times, according to a statement from the Middlesex district attorney's office and Cambridge police. It said there were no other victims. 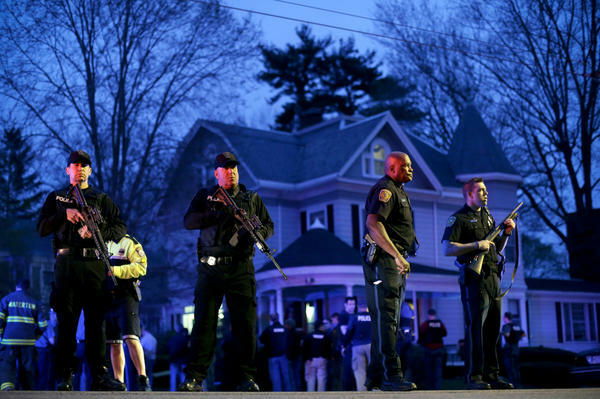 "Meanwhile, in Watertown, witnesses reported hearing multiple gunshots and explosions at about 1 a.m. Friday. Dozens of police officers and FBI agents were in the neighborhood and a helicopter circled overhead." Note: As happens when stories such as this are developing, there will likely be reports that turn out to be mistaken. Wednesday, for example, there were reports from CNN, the AP, WBUR and others that authorities either had arrested a suspect or were about to do that. It turned out that no one had been arrested or taken into custody. We will focus on news being reported by NPR, other news outlets with expertise, and statements from authorities who are in a position to know what's going on. And if some of that information turns out to be wrong, we'll update. There will be many heartbreaking stories in coming hours and days about the victims of Monday's bombings at the Boston Marathon. Among the first such tragic tales is that of the Richard family from Dorchester, Mass.